I was out with the family on Sunday and we popped into our local Dollar Tree to pick up some cheap necessities. 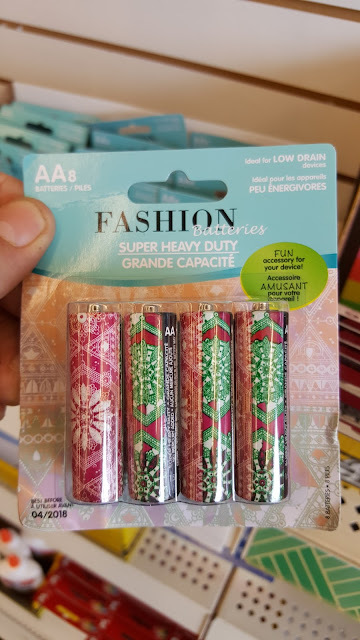 While putzing around, I happened upon a pack of Fashion Batteries. Now, I'm generally not one to cheap out on batteries unless they're going into a device that I won't use heavily like a TV remote. Still, even at a $1 price point, I can't see why anyone would want to go with fashion batteries as if they're some sort of accessory to whatever device you plan to use them in. Unless you've got a clear device, nobody is going to see your fashion batteries. I guess they may look alright if you've lost the battery cover to your device, assuming you don't duct tape over them to keep them in place. Fashion Batteries: A Fun Accessory For Your Device That Nobody Else Will Be Able To See!